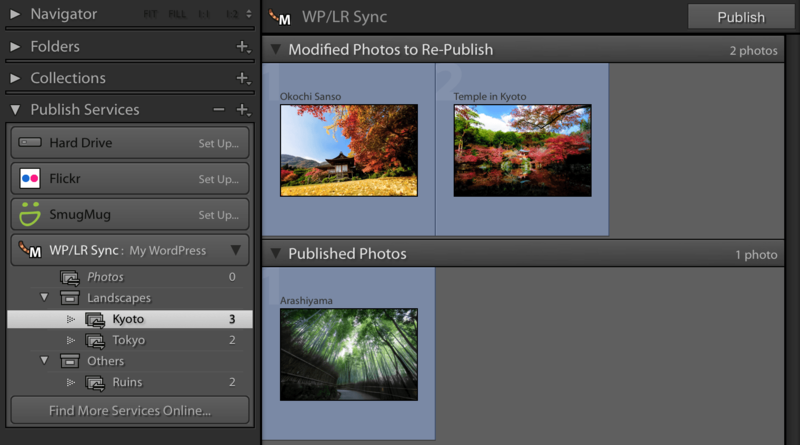 WP/LR Sync is a Lightroom Publish Service for WordPress. It exports your photos to WordPress, along with the folders and collections, and it keeps them synchronized. Any changes applied to your photos (post-processing, metadata, watermark, etc.) or your folders and collections will be replicated. Your WordPress website will be always synchronized with your Lightroom. and so many other use cases! WP/LR Sync is an essential tool for photographers or bloggers using a lot of photos in their articles. WP/LR Sync is a bundle of two plugins. One is available in the WordPress repository and has to be installed on your WordPress website. The other one is for Lightroom and can be downloaded from your account on the Meow Apps store. The two plugins will communicate and keep everything synchronized. You can learn how to install and use WP/LR Sync through this tutorial. Your Media Library will be synchronized with your WP/LR Sync Publish Service in Lightroom and will look like this. You will also be able to filter your photos by collection. For instance, below, I chose to only work with the photos of my collection Dreamland: The End. Note that WordPress only displays such custom filters in List Mode and not in Grid Mode (the icon on the left). If you are only interested in synchronizing your photos with your Media Library in WordPress, you don’t need to read further. It will work on any WordPress install. Just read the tutorial. WP/LR Sync works in a natural way with the standard WP Gallery (that means it doesn’t hijack your WordPress with its own system). You just need to add attributes to the [ gallery ] shortcode in WordPress, for examples wplr-collections=’…’ or wplr-keywords=’…’ and the photos will appear as in your Lightroom. There is a screen in WP/LR Sync that will help you figure out how to use those attributes. The images order for those attributes is handled by the Custom Order in Lightroom. To make your galleries look better, give a try to the Meow Gallery. If you want to see your hierarchy of folders and collections in your Media Library, there is a little option you can active. It’s simply called the explorer. Through different plugins and themes, you might have features related to galleries, albums or something similar. Those are not core features of WordPress, they are brought by specific plugins such as Photo Gallery, NextGEN or, ideally, themes. Their implementation is always different. You can’t even switch easily (or at all) from one to another. WP/LR Sync makes your folders, collections, and keywords available to those plugins and themes through the WP/LR Extensions. The extension called Post Types shipped with WP/LR Sync and covers most cases. For example, this extension can create one page (post or any other post type) per collection, and categorize (or any kind of taxonomy) them under a folder. Of course, this will be all kept synchronized through time. WP/LR Sync is clean and powerful. Since all its data is kept internally, you can even switch between plugins or between themes: your folders and collections can always follow you. This is for advanced users only and you might need a developer or a WordPress professional to help you. For more information: WP/LR Sync Extensions. There is an external API available through WP/LR Sync so that iPhone, Android developer or anybody else can use to make apps. There is one available for iPhone, you can search for it on the iTunes Store (it is not free, and not made by Meow Apps). WP/LR Sync doesn’t optimize your images; Lightroom does it then WordPress does it, WP/LR Sync is simply in between. For Lightroom, I recommend you to use JPEGmini. For WordPress, I have a page about Image Optimization plugins here: Image Optimization for WordPress. WP/LR Sync has plenty of features to please its geekiest users (and I am one of them). In Lightroom, you will find two interesting modules (in Library > Plug-in Extras). Total Synchronization will link (then synchronize) the photos you have previously uploaded to your WordPress with your Lightroom. This unique process uses image recognition and metadata to do the matching. You can learn more about it here. Switch Photos lets you pick two photos on your Lightroom (one should be already uploaded on your WordPress, the other not) and will switch them. That’s the easiest way to replace a photo by another one on your website. If you are curious to see what people and blogs say about the plugin, you can check those links. They can also help you understand what the plugin does.